Telecom company BT has together with Alcatel-Lucent created what they call the worlds fastest real-world internet connection. Using only hardware that is readily available they managed to reach 1.4 terabit per second transfer speed. The network can transmit 44 uncompressed HD movies in only one second. This is great news for those hoping to stream 4K media in the future! The researchers’ use of existing hardware is integral, as it will allow telecoms companies to meet the UK’s ever-increasing demand for faster internet speeds without having to replacing existing optical fibres. PARIS, Jan. 21, 2014 /PRNewswire/ — Alcatel-Lucent (euronext paris and nyse:ALU) and BT have today announced trial speeds of up to 1.4Tb/s with a record spectral efficiency of 5.7 bits per second per Hertz (b/s/Hz) on an existing core fiber connection. This is believed to be the fastest speed ever achieved in commercial grade hardware in a real-world environment and is equivalent to transmitting 44 uncompressed HD films in a single second. The field trial, conducted over an existing fiber link between the BT Tower in London and BT’s Adastral Park research campus in Suffolk, used a new ‘flexible grid’ infrastructure (Flexgrid) to vary the gaps between transmission channels, usually set at 50 Gigahertz (GHz). By increasing the density of channels on the fiber, this approach achieved up to 42.5 percent greater data transmission efficiency compared to today’s standard networks. 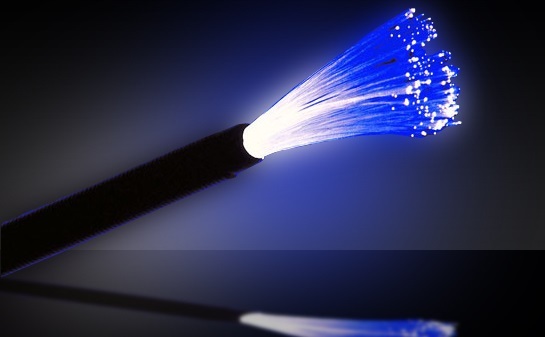 The trial demonstrated that use of the Flexgrid approach can increase BT’s core network capacity using existing optical fibers, potentially reducing the expense of laying more fiber as bandwidth demands grow. This could allow BT to more easily scale its core network capacity to meet consumer and business demands for more bandwidth-hungry services such as streaming video, whilst more efficiently using its existing core fiber infrastructure. The trial was conducted through the overlaying of an “Alien Super Channel” comprised of seven 200 Gigabits per second (Gb/s) channels bundled together to provide a combined capacity of 1.4 Tb/s. By reducing the spectral spacing between the channels from 50GHz to 35GHz using the 400Gb/s Photonic Services Engine (PSE) technology on the 1830 Photonic Service Switch (PSS), spectral efficiency is enhanced by almost 43%. The 1830 PSS can be used as an optical extension shelf of the 7750 Service Router (SR) and the 7950 Extensible Routing System (XRS). Flexgrid is the key to creating high-capacity, spectrally efficient super channels. The super channel is “alien” because it operates transparently on top of BT’s existing optical network. During October and November of 2013, BT and Alcatel-Lucent successfully demonstrated a number of world-leading high-speed alien wavelength technical achievements, including a record spectral efficiency of 5.7b/s/Hz which is equivalent to fitting a 1Tb super channel in less than 200GHz spectrum. About BT BT is one of the world’s leading providers of communications services and solutions, serving customers in more than 170 countries. Its principal activities include the provision of networked IT services globally; local, national and international telecommunications services to its customers for use at home, at work and on the move; broadband and internet products and services and converged fixed/mobile products and services. BT consists principally of four lines of business: BT Global Services, BT Retail, BT Wholesale and Openreach.